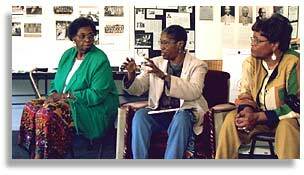 Robbie McCauley (center) makes a point during a discussion at the Appalachian African American Culture Center in Pennington Gap, Virginia. Photo by Nic Paget-Clarke. The following interview (part 2) with Robbie McCauley is part of series of interviews with some of the members of a group of 25 artists from around the U.S. and Canada who went to Kentucky and Virginia to participate in the initial stages of a multi-year, multi-site community art project sponsored by the American Festival Project. The American Festival Project is based in Whitesburg, Kentucky with Appalshop, a regional community arts center. Also see: Fred Campbell, Rodrigo Duarte Clark, Harrell Fletcher, Shannon Hummel, Stephanie Juno, Suzanne Lacy, John Malpede, Nobuko Miyamoto. Robbie McCauley: Ive been doing stories for a long time that emphasize racial prejudice. Prejudice is prejudging people before you know them, and racism is the systematic aspect keeping some people in certain categories. Ive been thinking recently in my own work, and especially since Ive been here in terms of my own looking, about how class is so connected, class is so much a part of that kind of racism. I used to dismiss that as an emphasis because I thought it would get me away from pointing the finger at how people are oppressed because of their race. But being here and recognizing that with all the problems that are inherent here in terms of race that what is most obvious is that the people who live here, who are mainly white, are just as brutalized as one could imagine. Their place of living. Those same forces who feel like its ok to insulate people, or ok to have racial prejudice, in order to have only some people having jobs. Its a new view of that for me. You can change your mind. The work of culture as I see it is to help people see differently. What Im constantly battling against is the way people are educated, given imagery to make them think that certain things are natural .There will always be the rich and the poor. Theres nothing you can do about it. As I get older I lose my sense, my good sense that tells me that thats garbage because of course I get a better job, I get more benefits. Im not as angry about the fact that its ridiculous to assume that some people will always have to live in misery. I would almost venture to say that a lot of what we talk about as the psychological reasons why people are miserable are based in the way weve been made to think through the system. People dont like to admit that theyve been made to think any kind of way. The mythology in this country is that one is an individual and that one comes to ones own thoughts, but I think that the reality is not either or. The reality is that you are constantly struggling with that and therefore the need to question to try to make sense of misery is important. But accepting human misery doesnt seem like the right thing to do. There is a right thing that one should always be struggling for. In Motion Magazine: Do you want to talk a little a bit about how this process has been unfolding for the last few days? Robbie McCauley: I dont feel the pressure to make a conclusion, but in my own work and in my life, and in this process, I think that there is a coming together of people who have been inspired by a common purpose and we will go back to where we came from and resonate that experience. Hopefully, specific collaborations can come out of it. Im certainly talking to people that I wouldnt have talked to if I hadnt had this experience and I dont just mean to artists. I mean talking to people in community about how what Im doing artistically could help let more people know. The more people know the more can get done about situations that we have been seeing today. Its well known among the population how historically one or two big companies have come here for coal mining, then strip mining, now the jails, and the land fills. When one resource is depleted, or it goes down in production as coal has, another corporation arrives. People are real clear about this history and theyve made some victories by understanding it and fighting against it as much as they can. But, theyve also been defeated many times. Theyve shut up and been quiet a lot in order to survive. But I think that this visit, hopefully, can help that process of resonating these stories and the conditions that come through these stories. To me the aesthetic comes out of that. Im not a politician and thats why I talk about resonating stories. We will find images that other people are effected by to give voice, to give images, to just sit down and have conversations that are pleasurable. In Motion Magazine: Do you think its been useful to actually live with people here for these few days? In Motion Magazine: They do? Robbie McCauley: Yes, they do. We have conversations every morning and every night its hard to go to bed. We laugh, we talk, we tell stories. They are an incredible couple. They are not ordinary but ordinary in a way. Really remarkable people. We are just very lucky to be with them. They have a family life that we share stories about. They tell us about their family. We talk about ours. The thing that Elia and I were talking about was how refreshing it is to be around people whose concerns are feeding the animals and the flowers and yet going to the meeting to organize around something. Question at the end of the week. In Motion Magazine: Now that the week is over, what do you think? Robbie McCauley: I think we who are gathered here are at a good place in a world that is changing. They are hard changes but this journey is at a good place. Thats my general response to what is going on. Specifically, I think some of the ideas that have come up to help that journey are doable. I think one of the biggest problems as always will be working with the power that we have. This involves recognizing how to use times and places and materials to make this journey. Theres another world that assumes that what goes on on the earth is in the control of a few but this journey is ours and this gathering reminds me of that. In Motion Magazine: What do you think of the concern that the artists are in the position of coming in and telling people how to fix their own community? Robbie McCauley: I think its something to be expected for obvious reasons. The people here live in a community which has long been manipulated by more powerful forces. They live in a place where promises are made and then people are disappointed. As well-intentioned as the artists are here we are perceived as outsiders. I think that in everybodys work here there is some sense of that. We all have paid attention to that before in the abstract, and in our work, but here and now it is one of the most uncomfortable aspects of this particular gathering. It is something which is good to be recognized. Im not sure what will come out of it but its certainly clear that this is something that must be dealt with in an on-going way. I wonder if thats not something that the work that we do can make less of an immobilizing problem and more of something to work with. I think if we keep paying attention to it we can find ways to consider it one of those barriers that can be an opportunity. I think that that resistance to work with people who are seen as outsiders is full of possibilities rather than it is something that should stop development from happening. We all need to recognize that this earth is ours. One of the things that I have come to here is a recognition of how essential it is for me to be concerned with the environment. I feel like that they are cutting off my mountains and, no, I dont live here, but these are my mountains. They are my daughters mountains. I wouldnt have known that if I didnt come here. If I can help do something about it with the people who live here, whose mountains they also are, then thats the way to think about it. But certainly I think that the work of finding connections between those who come and those who are here, is the work of the artist. Some of the things that we didnt attend to well enough were those things that have to do with that relationship. Id like to hear the various members of the communitys responses. I would also say that this time was more our time than theirs. Our coming together here and being in this community and having this short period of time of meeting with people was more beneficial to us, honestly, and we need to recognize that as we go on with all the looking at the ideas that came out of this. As we follow through on some of these ideas. As we change them. Throw them away. Look at other ones. Because of the work of being with the people here, some good seeds can be planted.